University of California Press, 9780520240650, 390pp. Founded by Ignatius Loyola in 1540, the Society of Jesus remains the largest and most controversial religious order of men in Catholicism. Since the 1960s, however, Jesuits in the United States have lost more than half of their members, and they have experienced a massive upheaval in what they believe and how they work and live. In this groundbreaking book, Peter McDonough and Eugene C. Bianchi draw on interviews and statements gathered from more than four hundred Jesuits and former Jesuits to provide an intimate look at turmoil among Catholicism's legendary best-and-brightest. Priests and former priests speak candidly about their reasons for joining (and leaving) the Jesuits, about their sexual development and orientation, about their spiritual crises and their engagement with other religious traditions. They discuss issues ranging from celibacy to the ordination of women, homosexuality, the rationale of the priesthood, the challenges of community life, and the divinity of Jesus. 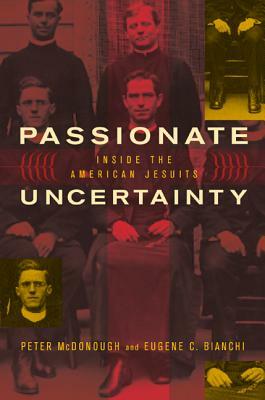 Passionate Uncertainty traces the transformation of the Society of Jesus from a fairly unified organization into a smaller, looser community with disparate goals and an elusive corporate identity. From its role as a traditional subculture during the days of immigrant Catholicism, the order has changed into an amalgam of countercultures shaped around social mission, sexual identity, and an eclectic spirituality. The story of the Jesuits reflects the crisis of clerical authority and the deep ambivalence surrounding American Catholicism's encounter with modernity. Peter McDonough is Professor Emeritus of Political Science at Arizona State University. He is author of Men Astutely Trained: A History of the Jesuits in the American Century (1992) and Power and Ideology in Brazil (1981) and coauthor of The Cultural Dynamics of Democratization in Spain (1998). Eugene C. Bianchi is Professor Emeritus of Religion at Emory University. He is author of Elder Wisdom: Crafting Your Own Elderhood (1994) and coeditor of A Democratic Catholic Church (1992).